1Combine the cinnamon swirl ingredients in a zip-lock baggie (snack size is perfect) and squish around to combine. Set aside while you make the batter. (Letting it sit for a bit will allow the butter to firm up somewhat, making it easier to squeeze. If it gets too cool and firm, place the sealed bag in a glass of warm water to soften it again. 2In a medium bowl, beat the butter and cream cheese until smooth; beat in the icing sugar and vanilla along with enough milk or water to make a drippy drizzle. 3To make the pancake batter: in a medium bowl, whisk together the flour, sugar, baking powder and salt. Whisk in the milk, eggs and oil, just until combined. 4Heat a large, heavy skillet over medium heat and add a drizzle of oil or spray it with nonstick spray. Ladle about 1/3-1/2 cup batter into the pan and let cook for a minute. Snip a small corner off the zip-lock bag of filling and squeeze it out in a swirl onto the pancake batter. Once the bubbles begin to break through around the edges and it's golden on the bottom, gently flip it with a thin spatula and cook for another 2 minutes on the other side. 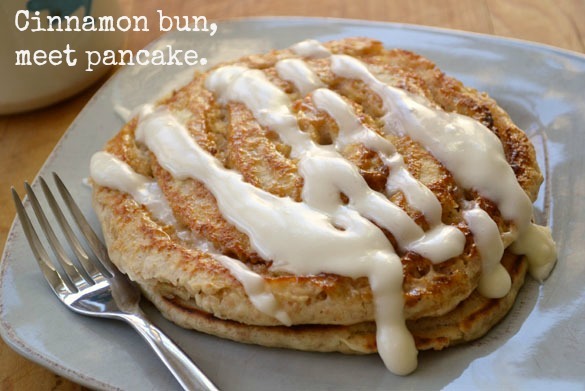 Wipe the pan out with a paper towel (so that residual cinnamon goo doesn't burn) and carry on with the next pancake. Serve warm, drizzled with cream cheese drizzle.